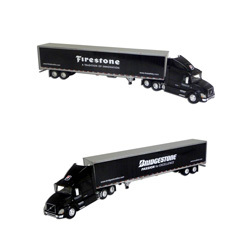 This new 1:64th scale collectible tractor trailer is a replication of the actual over-the-road Bridgestone Firestone Fleet Tractor / Trailer. Emblazoned with the popular corporate logos of Bridgestone on driver’s side and Firestone on passenger side of the trailer. Bridgestone/Firestone’s 300 tractor and 600 trailer fleet supplies tires and automotive parts to more than 4,000 customer’s nationwide, including company stores, independent tire dealers, mass merchandisers and wholesale clubs. 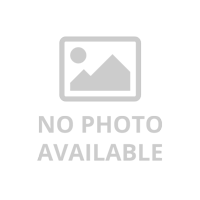 The fleet also carries loads for other shippers under its for-hire operating authority. The Bridgestone/Firestone fleet is headquartered in Nashville, Tenn., and covers assigned territories from seven company distribution centers.